I’ve just come back from the mill with a 5-liter jug of fresh extra virgin olive oil, fruit of my labor—I picked 60 kilos (132 pounds) of olives. I’ve still got more to pick, so, hopefully, I’ll earn another 5 to 10 liters, enough for all my cooking for about nine months. 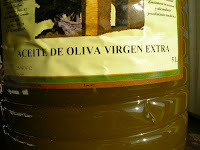 Olive oil from the mill. I use olive oil exclusively in my kitchen—to “butter” the toast, to baste a turkey, drizzle on green beans, dress a salad, sautée and stir-fry. I don’t do a lot of “deep” frying, not because olive oil is not suitable, but because of calorie considerations. But today I’m making a pile of fries, Spanish fries, olive oil fries. 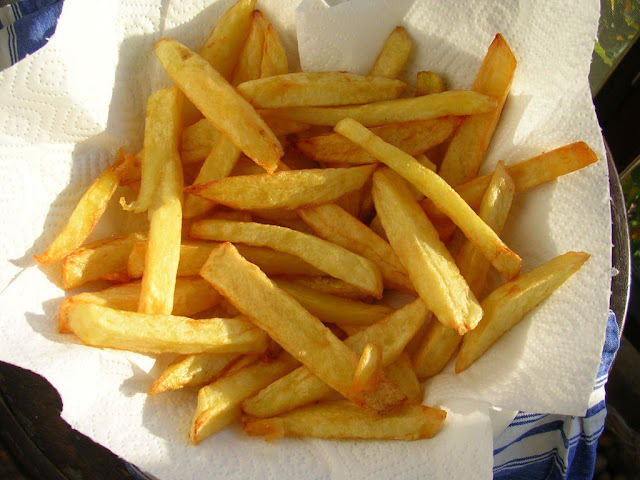 Fried potatoes are a wonderful flavor-test for new oil. 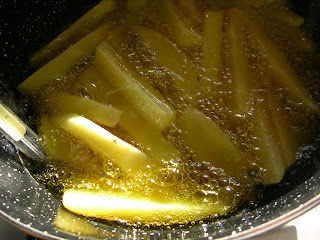 I thick-cut the potatoes, heat the oil to about 360ºF—only about 2 inches of oil, enough to barely submerge the potatoes. At that temperature the oil is shimmering, not quite smoking. —and let them fry until tender, lightly crusted and golden. This takes 10 to 15 minutes. 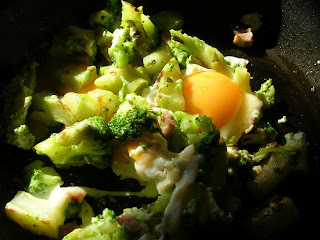 Potatoes frying in olive oil. Drained on paper towels and sprinkled with salt, they are ready to eat. These fries are not crisp. If you want them crisp, more like “french” fries, reheat the oil and return the potatoes to the pan until browned. They will emerge from the second frying with a crunchy exterior. When the oil is cool, I strain and reserve it. Olive oil can be used three or four times for frying. (Unlike other oils, which break down with repeated use.) 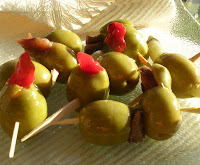 Maybe some croquettes or boquerones, fresh anchovies, will be next. 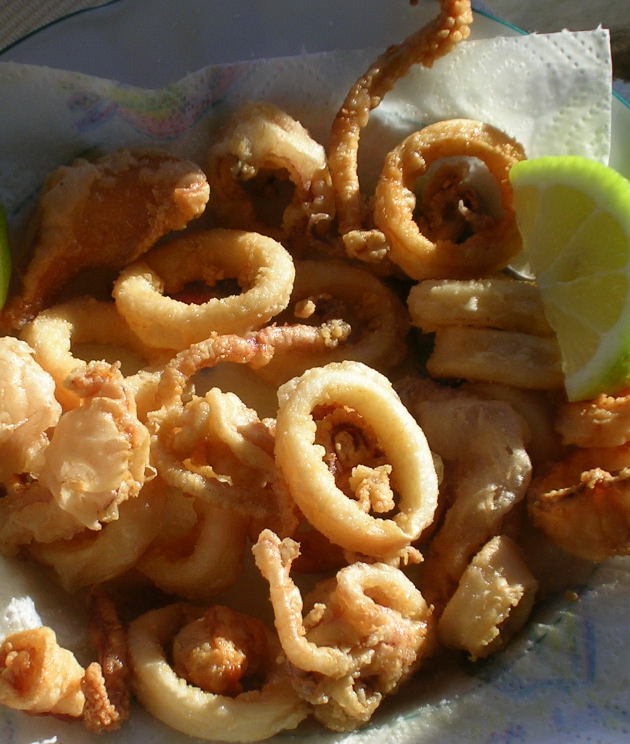 Whatever you’ve heard about olive oil not being suitable for deep frying is a myth. What can be said is that, because the fruity olive aromas are lost at high temperatures, frying is not what you want to do with your very pricey, delicate olive oil. My extra virgin oil, straight from the mill, is relatively cheap. I can afford to use it for frying. If cost is an issue, you can use non-virgin olive oil (simply labeled “olive oil”), for frying. 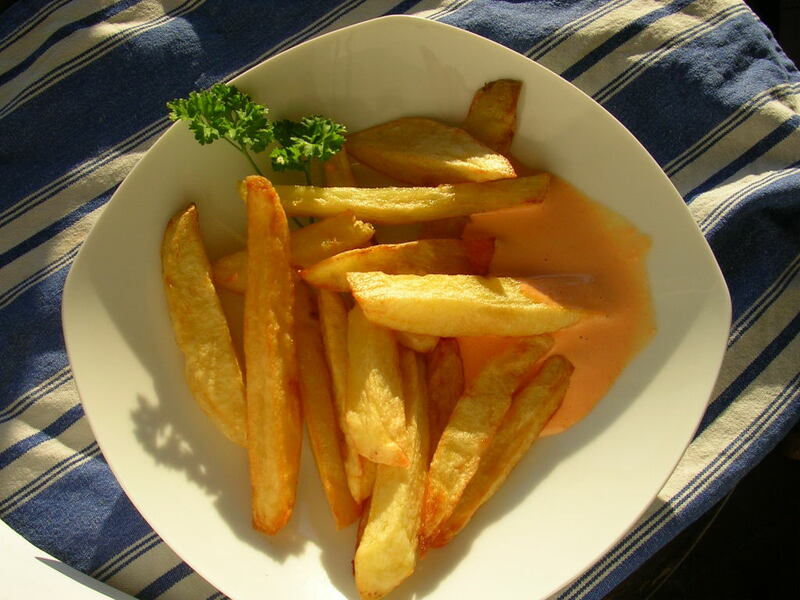 To accompany my patatas fritas, fried potatoes, I made some piquillo pepper garlic mayonnaise, also using the new oil. Really good slathered on a burger, too. Put the garlic and egg in a blender and pulse until garlic is finely chopped. With the motor running, pour in the oil in a slow trickle, allowing it to be absorbed by the egg before adding more. Blend in all the oil. The sauce will emulsify and thicken. Blend in the salt and lemon juice. Add the chopped piquillo peppers and blend until smooth. The sauce will keep, refrigerated, for up to 2 days. 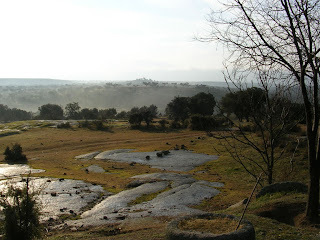 Los Yébenes spreads out on the flanks of a long ridge, where a pair of 16th century windmills rides the crest. 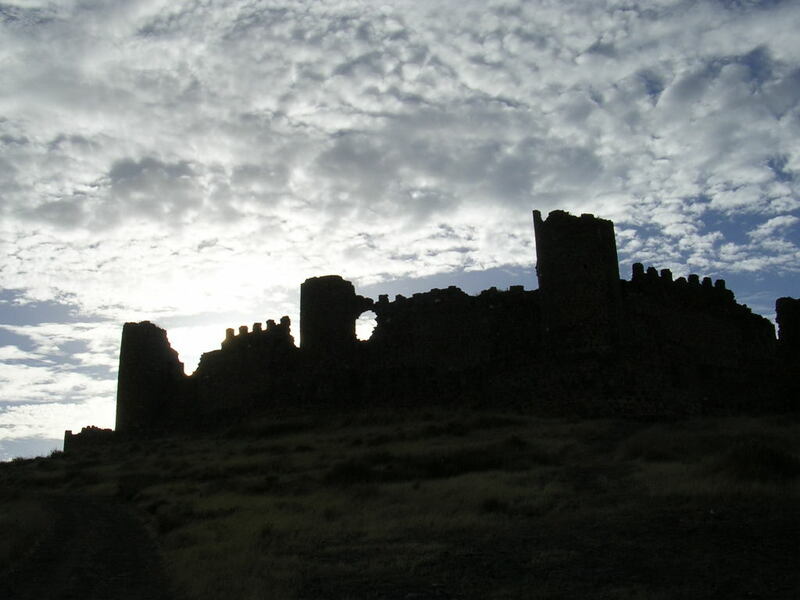 The village, south of the medieval city of Toledo, about 90 kilometres from Madrid, is known as the hunting capital of the highland Montes de Toledo. Hare, rabbit, deer, and boar are abundant, but it is the native red-legged partridge that is the delight of both hunter in the field and gastronome at table. I went to Los Yébenes a few years ago when I was working on a book about the food of La Mancha. I was tracking partridge from hillside to dinner, so I visited during the open season for partridge shooting (October to February) and went along on a cacería de ojeo, an organized hunt. It was a nippy winter’s day, with clouds hanging over the hilltops, when we met at a hunting lodge not too distant from Los Yébenes. The group of hunters gathered over steaming cups of coffee to draw lots for the puestos, blinds, that they would occupy on the hunt. Some of the hunters came from abroad and were staying at the lodge. Others, like Teodoro, a well-to-do businessman, drove down from Toledo for the day, bringing dogs and gear. The hunters (a few women among them) moved out in SUVs, bumping along rutted dirt tracks and fording a small stream. Leaving the vehicles, they trekked cross-country to the first shooting site. Sun broke through the cloud cover, glinting on flat outcroppings of shiny granite. Tramping boots released the powerful scent of wild thyme, marjoram, and red lavender. Teodoro, dressed in cropped breeches with gaiters and loden green jacket, was flanked by a loader, who kept his guns ready to fire, and a secretario, who spotted and recovered the downed birds. Teodoro tethered his one-year old Labrador retriever to a stake. The hunters with their entourages spread along the ridge, taking up ten blinds. The ojeadores, beaters, announced the start of the hunt with a blast on a conch shell. They moved along the ravine’s embankment, thrashing the bushes, banging, and yelling, “vamos, vamos”. The first shots rang out, followed fast by many more. The beaters continued towards our blind, flushing birds before them. Suddenly, with a rush of wings, a covey of partridge lofted skyward. They seemed to scatter in the air, some soaring high, others dipping towards the next ridge. Teodoro shot in rapid succession. One bird fell very near the blind, causing the dog to snap to attention. When the beaters reached the end of the line, they signalled the end of the shoot with a horn and everyone scrambled to find the downed birds. The Labrador excitedly worked the hillside, retrieving partridge one after another to Teodoro. The secretario strung them on leather thongs and hitched them to his belt. The whole hunting party walked overland to another line. A light snow began to fall. 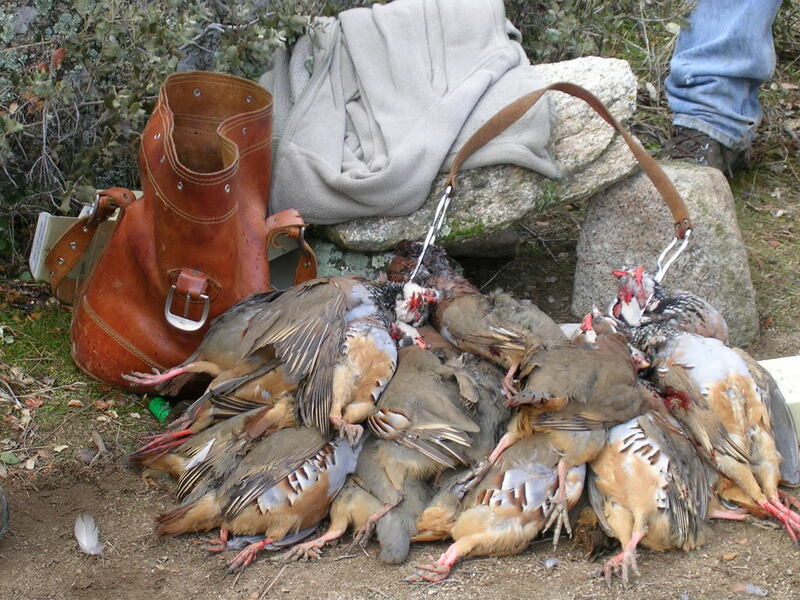 At the end of the second shoot (typically, there are four or five lines in a day of hunting) the secretarios spread all the birds in a clearing on the ground, arranging them in braces. 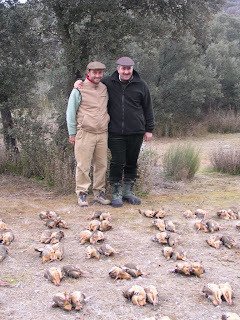 There were 126 partridge. Teodoro, the best shot, claimed 28. Some he would take home with him. He said his mother prepares them en conserva, packed in jars in a mild escabeche. Behind the hunters came the pollero, poultyman. He buys the birds from the organizer of the hunt and hauls them to a processing plant, where they are cleaned and plucked, ready for sale. To start, we savoured partridge pâté with toast. Next was a partridge salad featuring tender, boned partridge in a mild escabeche heaped on top of sliced tomatoes, sprinkled with oregano, and generously drizzled with the local extra virgin olive oil with denomination Montes de Toledo. We shared an order of beans stewed with partridge. A partridge feast, with a smooth reserva La Mancha red wine to accompany it. 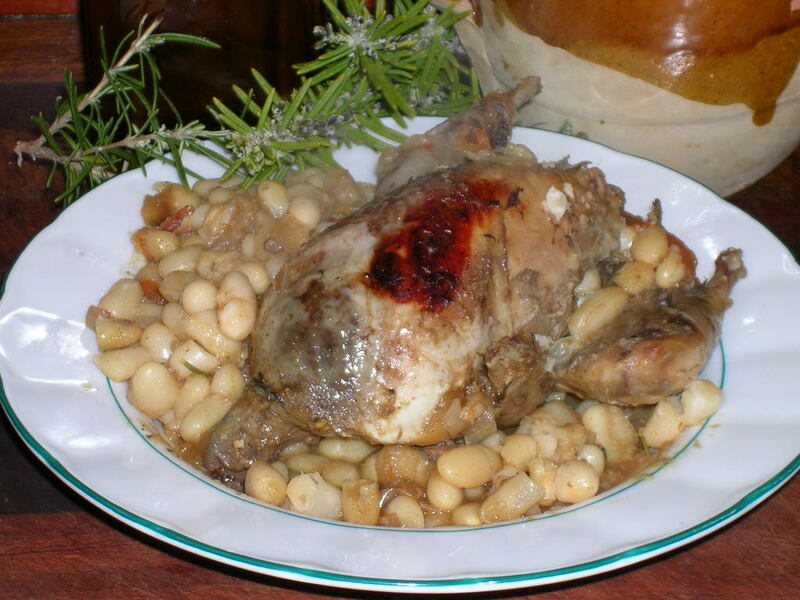 Beans stretch the servings of partridge, so a single bird, split in half, might serve two. If you choose to serve half a partridge, split the birds after cooking. 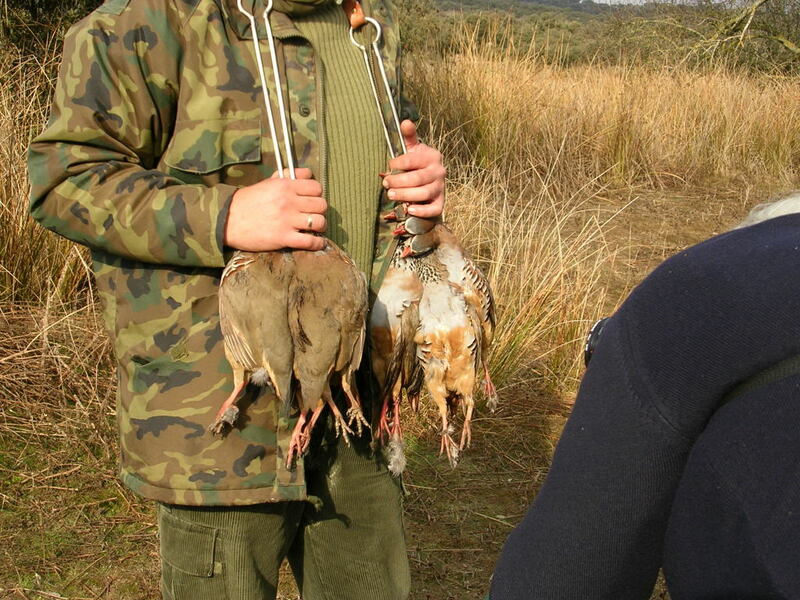 If partridge is not available, use cornish game birds or turkey thighs. I prefer to cook the beans separately from the partridge, as beans can take well over an hour to cook. You could use canned cannellini beans (2 15-ounce cans). If using dry ones, put them to soak at least 6 hours before cooking. Soak the beans in water at least 6 hours or up to 24 hours. Drain and place them in a pot with water to cover. Bring to a boil and skim off froth. Slice the top off the head of garlic and place the whole head in the pot with the beans. Add the bay leaves, rosemary, onion, tomato, and 1 teaspoon of salt. Cover and simmer the beans 30 minutes. Add ½ cup cold water, bring again to a boil, and simmer until beans are very tender, 30 to 60 minutes more. Sprinkle partridge with salt and pepper. Heat the oil in a large cazuela or deep skillet. Brown the partridge very slowly. After turning them, add the chopped onion and garlic to the cazuela. Continue sautéeing until partridge and onions are golden. In a small bowl mix the pimentón with the vinegar. Add to the partridge with the wine and 1 cup of water. Add the peppercorns and 1 teaspoon of salt. Cook at a gentle bubble for 30 minutes. Turn the partridges and simmer 30 minutes more. Drain the beans, reserving the liquid. Discard the bay leaves and rosemary. Add the beans to the cazuela with the partridge. Slip the skin from the tomato and break it up into the cazuela. Squeeze the cloves of garlic into the partridge. Add 2 cups of the bean liquid. Simmer all together for 30 minutes. Hillside castle in Toledo province. Some of my favorite Spanish tapas. Got a question about Spanish cooking? Looking for a recipe? Need some tips on paella making? 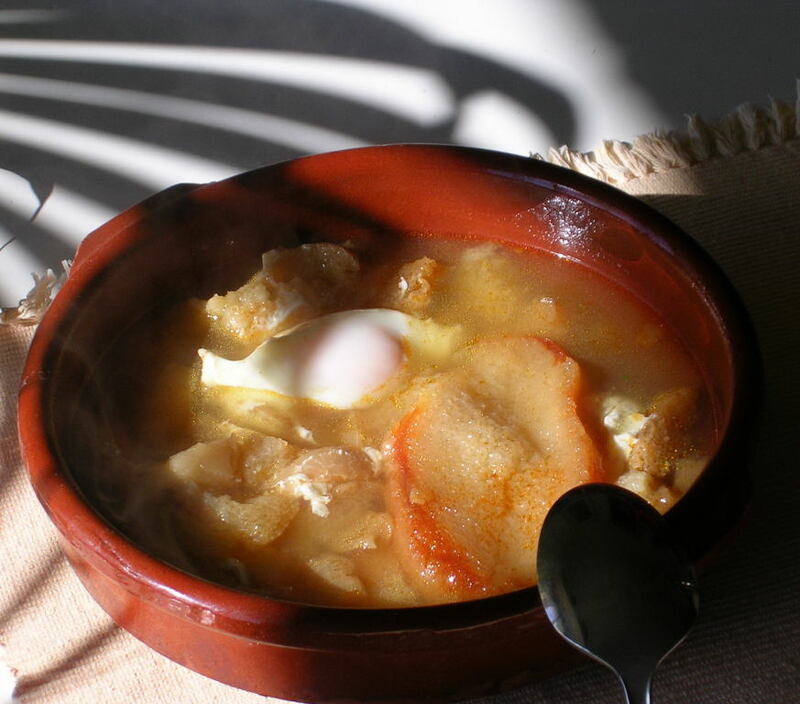 Searching for instructions to prepare bacalao? Ask me! I’m the expert on Spanish cooking. Just leave your question in the COMMENTS. I’ll either reply in the comments or, if it’s an inspiring question, write a blog posting about it. 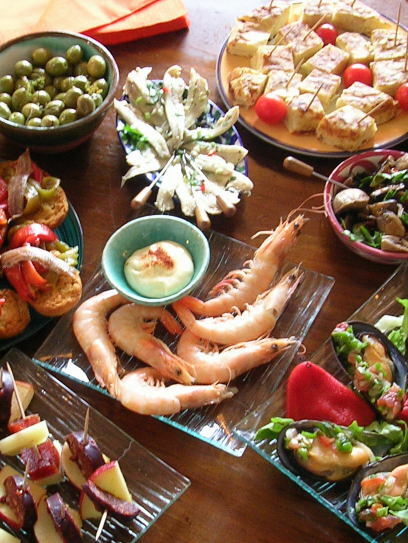 Recently a fellow-American living in Spain, Ansley Evans, an instructor of English at the University of Murcia, asked me a bunch of questions, about me, about Spanish food. The interview was an assignment for an online Food Writing course she is taking. She asked some very good questions. 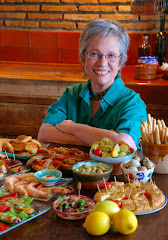 She posted the interview on her blog (read the whole interview http://gowithcuriosity.com/2011/11/11/wisdom-from-a-spanish-kitchen-a-conversation-with-journalist-and-cookbook-author-janet-mendel/#comment-82 here). Here are some excerpts. 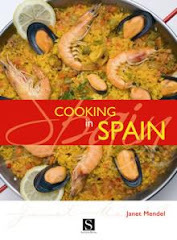 Ansley: When I first moved to Spain nearly three years ago, I had done very little Spanish cooking. As is the case with many foreigners who land here, it didn’t take long before I was enamored with the food. 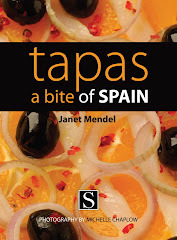 I soon found myself wanting to learn as much as I could about Spanish cuisine from a range of perspectives, which led me to American journalist and cookbook author Janet Mendel. 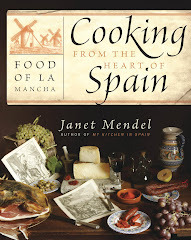 Mendel’s Traditional Spanish Cooking was the first Spanish cookbook written in English I bought. 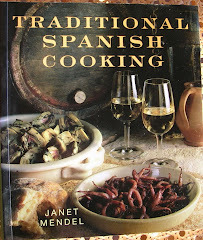 I loved how she captured the essence of simple, flavorful and seasonal village cooking from across Spain. The delicious simplicity of the dishes Mendel includes helped me understand why tradition remains so strong in Spanish kitchens today. I have been inspired by Mendel’s work, and was thrilled when she agreed to answer my questions. AE: One thing I appreciate about your books and blog is your voice. The stories you tell are just as welcoming and giving as all those cooks who have invited you into their kitchens. I particularly feel this in your cookbook My Kitchen in Spain (which is really part memoir, as well). 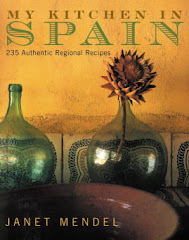 While reading the stories and recipes within, it is as if I have been invited into a Spanish home. I get the sense it hasn’t just been the recipes and flavors that have inspired your writing, but also the generous spirit of all the people you’ve broken bread with in Spain. JM.You’re absolutely right. In the first place, seeking out recipes was a way to get to know people—village housewives, the guys in the market, the butcher, the baker, the basket maker. Talking about food gained me entry into homes—and hearts—of the people I was living amongst. Maybe it’s because I am, not a culinary professional, but a reporter. I like telling people’s stories, and those stories often revolve around food. AE: I find that Spain sparks the imagination of foreigners (such as myself) more than many other countries, with its fiestas, boisterous bars, flamenco and siestas. While you have lived here for many years and are a true local, your voice remains one of enchantment with the country and its cooking. I really appreciate that. How do you keep the spark alive? 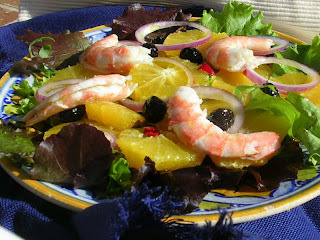 Salad with oranges, olives and shrimp. JM. Perhaps it’s because there are always new “sparks”—a new region to visit (I first visited the Sierra de Aracena, where Jabugo ham comes from, last year and was enchanted by the region); a new food; a new perspective (I enjoy watching Un Pais para Comerselo or José Andres Made in Spain because they give different perspectives); etc. Spain continues to amaze and enchant with the diversity of landscapes, monuments, cuisines. Thank god, Ansley never asked the dreaded question, “What’s your favorite Spanish dish?” Which, of course, I could never answer. But the pictures on this page suggest at least some of the answer. You can read more about me here and more about the cookbooks I’ve written here. I look forward to hearing from you, fielding your questions about Spanish food. 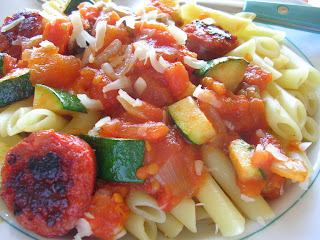 Pasta with sofrito and chorizo. I still have late-crop tomatoes ripening in the garden. I’ve been blanching, skinning and bagging them for the freezer—a great asset for winter’s soups and sauces. 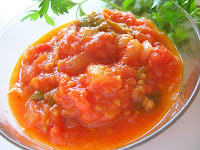 But today I was inspired to make a batch of sofrito, some to use immediately and some to freeze. 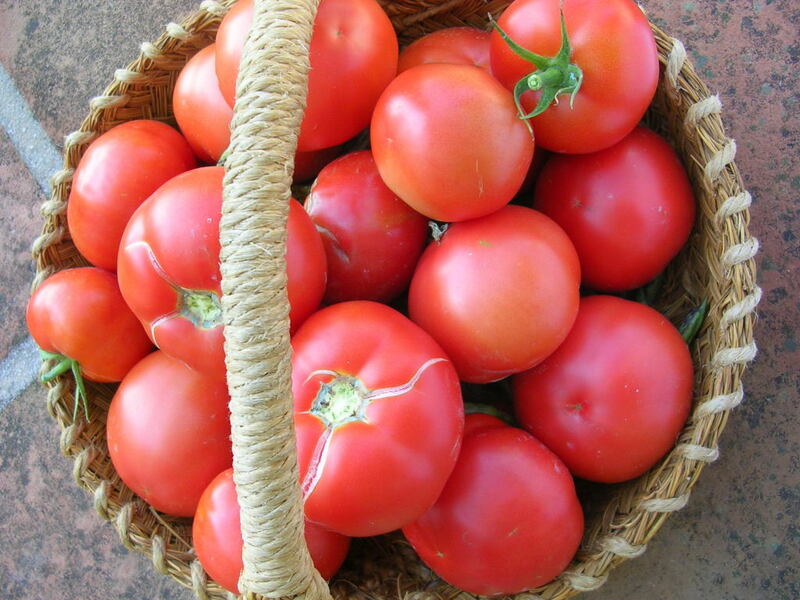 Late-crop tomatoes from the garden. 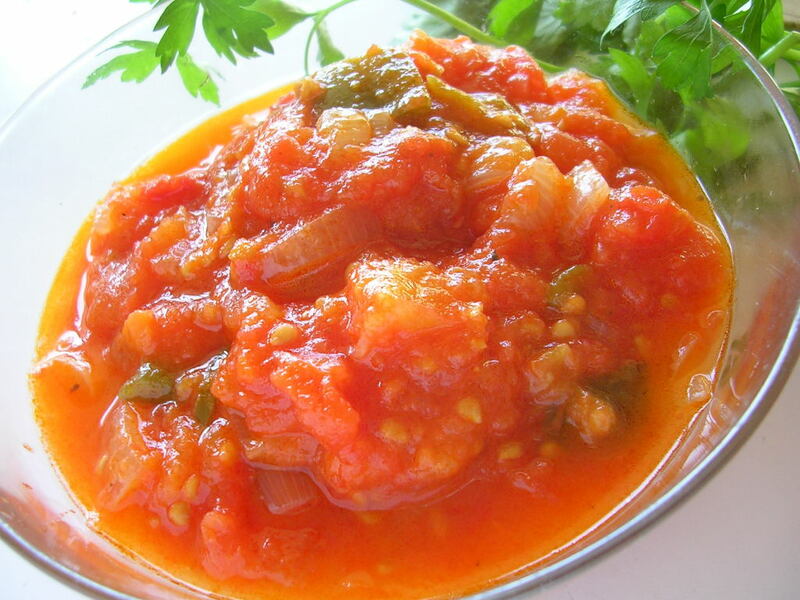 Quite a lot of mystique accompanies sofrito, considered the “mother” of all sauces. Sofrito means “fried gently.” Sofrito is the first step in many recipes. 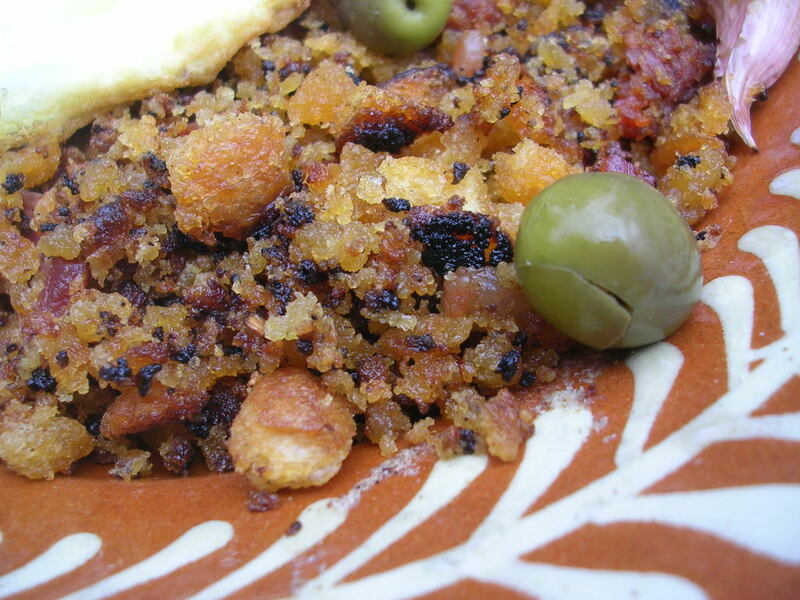 It is, basically, a mixture of sautéed ingredients that gives depth of flavor to many dishes in Spanish cooking, from paella to stew, vegetables to pasta. It’s a procedure, a technique and a sauce. 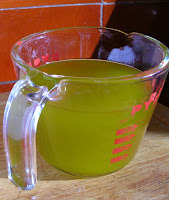 The essential ingredient in sofrito is olive oil. First, onions, garlic and green pepper are sautéed slowly in the oil. 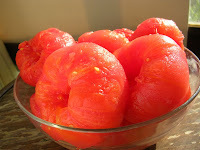 Then skinned and chopped tomatoes are added and allowed to reduce. Sometimes browning meat or chicken is part of the procedure. Sometimes the onions are allowed to nearly caramelize in the oil. Often the sofrito serves as a cook-in sauce, added to foods, usually with additional liquid such as wine, to continue cooking until done. In the case of shellfish, this is a matter of minutes, whereas stewing beef or lamb might take an hour or more and require additional liquid. Herbs and spices are added, depending on what is being cooked in the sofrito. To peel tomatoes: Remove cores. Immerse the tomatoes in boiling water for about 1 minute. Drain and cool. Slip off the skins. Chopped and ready to cook. 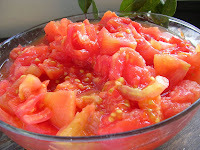 If a larger quantity of tomatoes is used, the sofrito becomes tomate frito, a basic tomato sauce. It can be left chunky or sieved to make a smooth sauce. Chicken, pork or meatballs that have been first browned in oil are added to it to finish cooking. 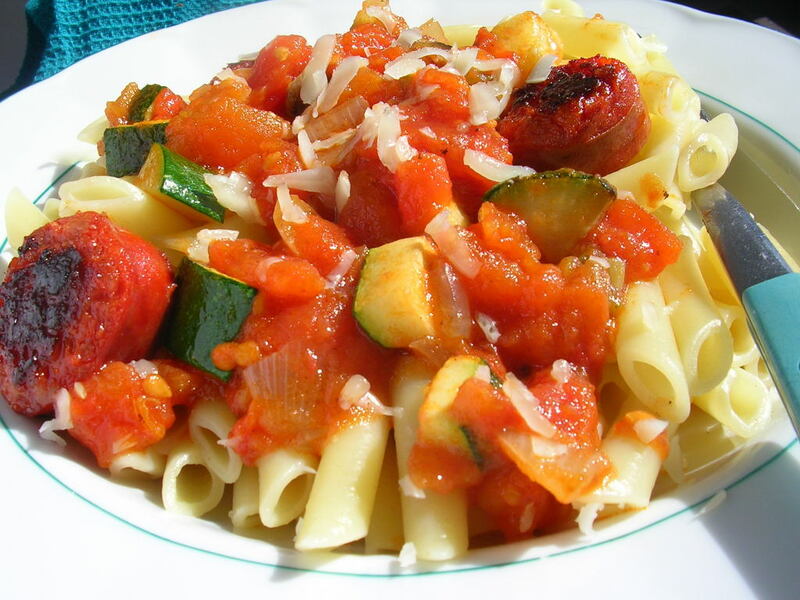 The sauce can be served over cooked pasta. This is a basic tomato sauce that can be served as an accompaniment to cooked foods such as pasta or as cooking medium for foods such as meatballs (see the recipe for meatballs here). You can vary the flavor of the sauce by adding other herbs or by using smoked pimentón. Use the sauce chunky or puree it in a blender. 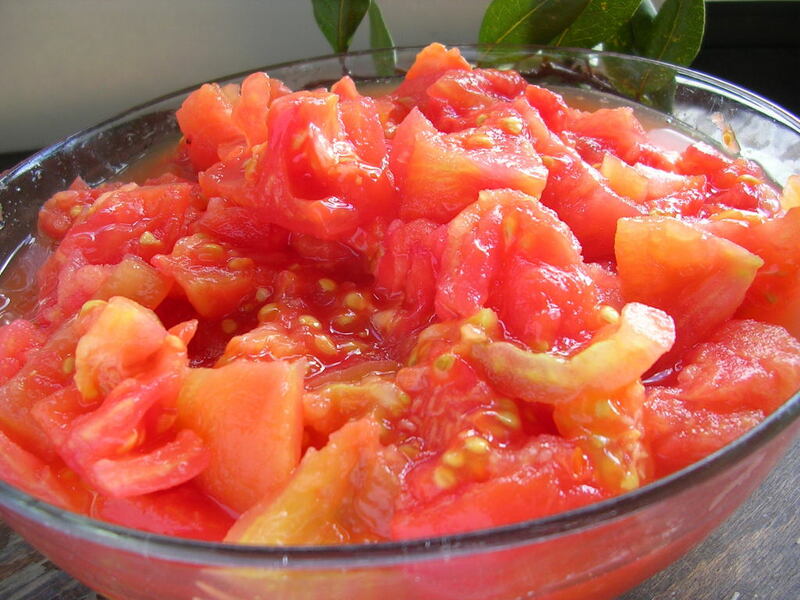 If desired, the sauce can be sieved as well (removes all tomato seeds). Heat oil in a saucepan and sauté the onion, peppers and garlic until onion begins to turn golden, 5 to 10 minutes. Add the parsley or oregano and red pepper flakes and pimentón, if using. Stir over medium heat 30 seconds. Add the tomatoes, cumin, bay leaf, salt, and pepper. Bring to a boil, cover, and simmer until tomatoes are thickened, 30 minutes. Use the sauce as is or puree in a blender. Serve the sauce hot or room temperature. 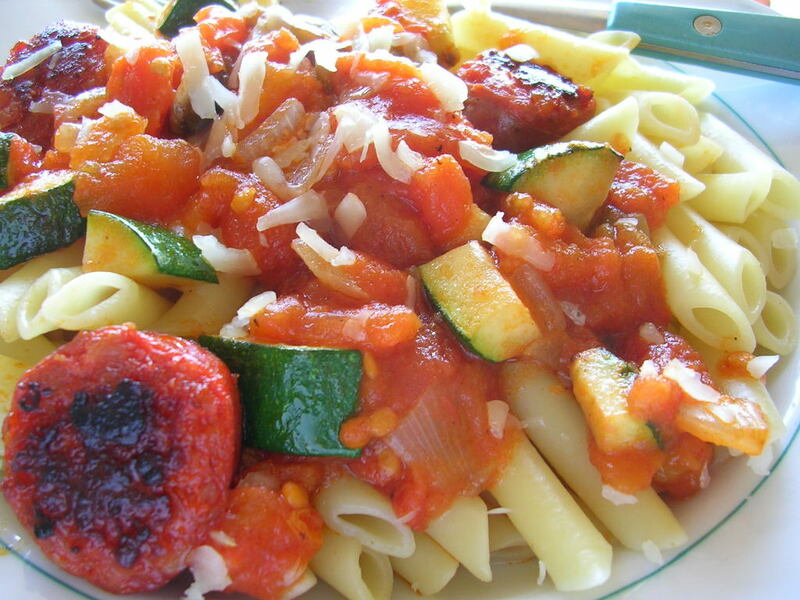 Pasta with chorizo and tomato sauce. This is a wonderful every-day way to prepare pasta. Chorizo adds a flavor “package” to a basic sofrito. You can use either hard, slicing chorizo or soft cooking chorizo. Cheese on top is an option. Heat the oil in a deep skillet or cazuela and add the green pepper, onion, zucchini, garlic, and chorizo. Sauté on high heat for 10 minutes. Add the tomatoes, oregano, pepper, and salt. Cook until slightly reduced, about 20 minutes longer. Cook the pasta in boiling water until al dente (about 8 minutes). Drain the pasta and combine with the sauce. Serve with grated cheese, if desired.